Book this private tour to experience a half-day adventure at the Yala National Park in the morning. The gateway to Yala National Park is Tissamaharama and a 20 km drive via Kirinda takes the visitors to the Palatupana. At Palatupana, the well-designed visitor center provides the information to the tourists and assign a tracker to all incoming vehicles. The park provides jeeps with soft-tops which give you a better view of wildlife. This morning tour will also allow you to experience the beautiful sunrise in the Yala National Park. 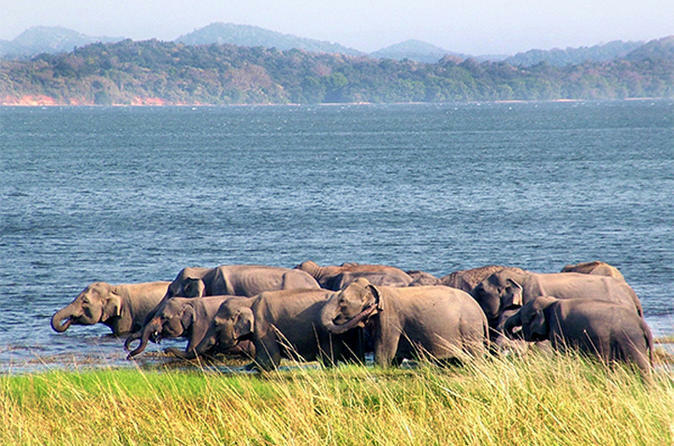 Book this private tour to experience an adventure at the Yala National Park. Yala National Park is located in the south-eastern region of Sri Lanka and extends over two provinces of Hambantota district of southern province and Monaragala district in Uva province. The entrance to the park is at Palatupana, 12km from Kirinda. The park provides jeeps with soft–tops which gives the opportunity to view wild life. Witness the dawn or dusk or both (depending on the option you choose) at the Yala National Park that bring about the best timing for safari tours. Book this private tour to experience a half-day adventure at the Yala National Park in the afternoon. The gateway to Yala National Park is in Tissamaharama, about a 20 km drive via Kirinda, which takes visitors to the Palatupana. At Palatupana, the well-designed visitor center provides the information to the tourists and assigns a tracker to all incoming vehicles. The park provides jeeps with soft-tops which give you a better view of wildlife. This afternoon tour will also allow you to experience the mesmerizing sunset in the Yala National Park.